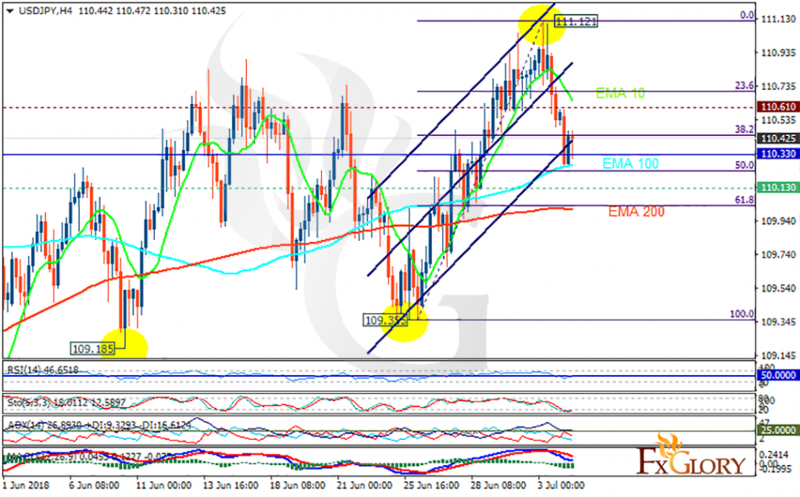 USD got weakened during the trading session on Tuesday and due to the Independence Day, USDJPY will stay calm today. USDJPY is also under the influence of the trade war. The support rests at 110.130 with resistance at 110.610 which the weekly pivot point at 110.330 is located in between the lines. The EMA of 10 is moving with bearish bias in the ascendant channel but it is above the EMA of 200 and the EMA of 100. The RSI is moving below the 50 level, the Stochastic is moving in low ranges and the MACD line is below the signal line in the negative territory. The ADX is showing weak sell signal. USDJPY may continue its decline towards the 61.8 level of Fibonacci at 110 but this level will remain the floor for this quiet market.